“YOU NEVER TOLD ME THAT.” ? Creating the proper expectations and outlining your basic protocols and procedures is a crucial step needed at the end of an enrollment process. It helps everyone know how things work and what to do if there is an issue. 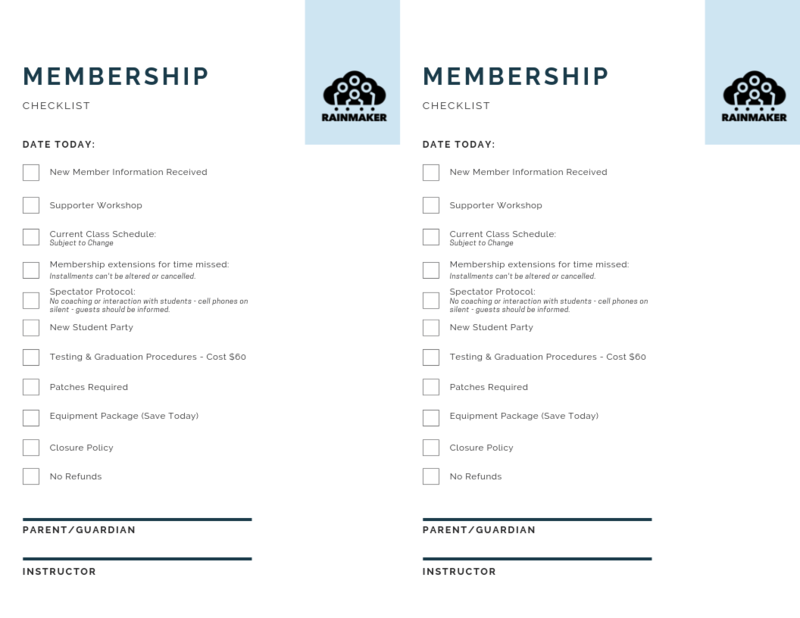 Using a membership checklist after the enrollment is complete helps ensure that your enrollment director or anyone responsible for sign-ups is communicating all the details which is important since it’s easy to be rushed or forget some of the finer points of your program. This membership checklist reduces confusion and promotes many of the extra benefits you provide. Notice how it’s balanced between added advantages and premium requirements. The document also helps to make sure your team does invite the student to take advantage of your New Student Kit and the savings incentive for ordering it at the point of enrollment. Without the list, we’ve seen as many as 8 out of 10 members NOT offered the revenue boosting package. 100 percent of the members are informed properly. Keep in mind, you can create a Digital Membership Checklist using RainMaker’s Survey feature, which makes it easy to become and stay paperless.